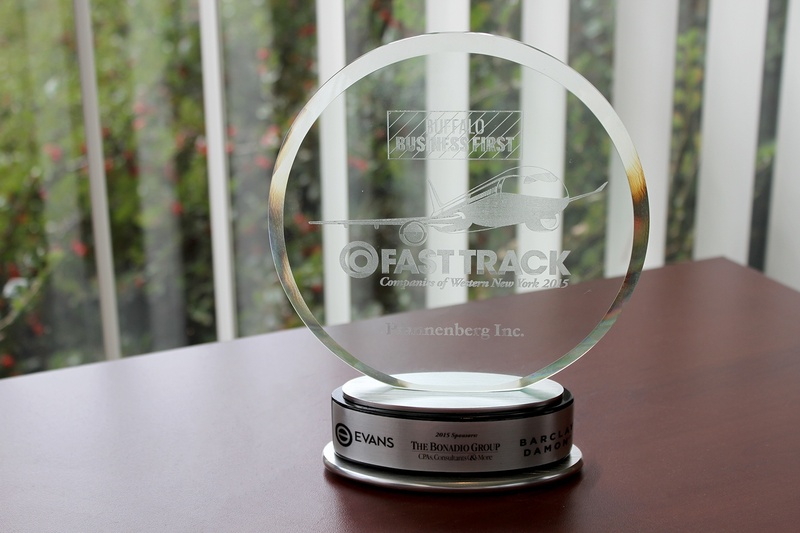 Pfannenberg was once again recognized as one of Western New York's Fastest Growing Companies for 2015 during the Fast Track Awards Program organized by Buffalo Business First. Pfannenberg have been named on the Fast Track 50 list for 9 years in total since 2012 and this is the fifth consecutive year that Pfannenberg is awarded. The company grew almost 28% compared to 2014's annual sales. Pfannenberg's North American Headquarters, located in Lancaster, NY manufactures devices which provide thermal management of industrial electrical enclosures as well as signaling technologies. These products include: The original Filterfan®, AC cooling units, enclosure heaters, air water heat exchangers, air to air heat exchangers, chillers, hydrostats and thermostats as well as industrial signaling devices for alarm, warning and indication. Buffalo's Business First newspaper annually surveys and ranks growth of area businesses. Growth rate rankings were determined by a score based on percentage of growth in total sales and number of U.S. employees over a three-year period. In order to be considered, each company must be for-profit and privately held, generate an average of at least $1 million in revenue for the three most recent years and have a three-year operating sales history. To learn more about Pfannenberg, check out our Corporate Video.